In my February blog I talked about decluttering, and in March, my topic was all about cleaning. Now it’s time to talk about your curb appeal! Let’s talk about why curb appeal is so important. From the moment potential buyers drive up to your house, they will be forming their first impression. In fact, within 15 seconds of arriving, that first impression is already made, and they will be looking to reinforce their positive (or negative) reaction throughout the rest of your home. Let’s make sure their first impression is a great one! So what does curb appeal mean? This is everything from clean windows to beautifully potted plants at the front door. Let’s start with repairs and maintenance. What shape are your shingles in? Are your gutters cleaned out or is there a forest growing out of them? How about the eaves? Do they need painting or cleaning? And window trim, front door and attached garage door? Do any of these need a touch-up of paint? Consider changing the color of your front door to emphasize it, but get some advice from a color professional first. Perhaps you want to add shutters to front windows or window boxes that overflow with flowers. You might even want to consider a new mailbox or new address sign if yours have seen better days. Are your windows clean from the inside out? To really make them shine, you can remove the screens and just store those in the garage. How did your landscaping weather the winter? Replace all dead and dying shrubbery. Don’t worry if your new plantings aren’t filled in by the time you show your house. New landscaping and fresh mulch will send a good message. Also sod or reseed where grass has died. If your shrubbery came back in good shape, just prune it up and allow light into the windows of your house. The same goes for trees. 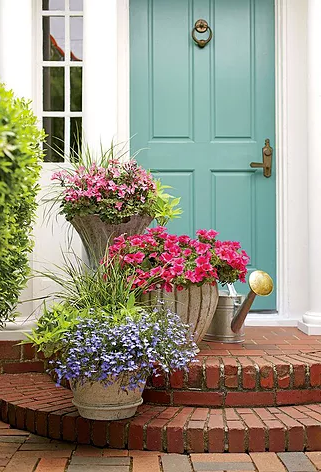 The front door of your house is your focal point, so emphasize that by adding flower plantings leading up to the door with some landscaping lighting. Plant annuals in pots for the front steps, or place hanging flowers next to the door. If you have the space, set a bench or cute rocker near the front door. At the very least, put out a new welcome mat. But, I highly recommend adding some flowers. They just bring so much life to a home! Make sure you buy flowers that are suited for the amount of sunlight that your front door area receives. Generally, anything more than six hours of direct sunlight per day is considered full sun in the world of annuals (flowers that bloom for one season). Flowers that are potted need to be watered daily, especially if they’re in clay pots. So, if you’re going on vacation, make sure you get someone to water your potted plants while you’re gone! the kid’s toys and bikes in your garage. Then fertilize, water, and mow grass and trim edges regularly for great curb appeal!